April's Little Family: Water Bill, Be Damned. 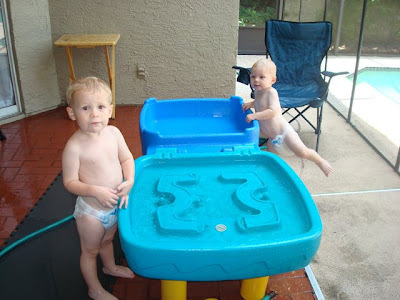 A couple weeks ago, while my Dad was visiting, we made a trip to the local Wal-Mart and left with a baby pool. The kids were going to make a mess, it was a fight waiting to happen and the pool would eventually make a quiet escape in the night. But, alas. It's a miracle pool. 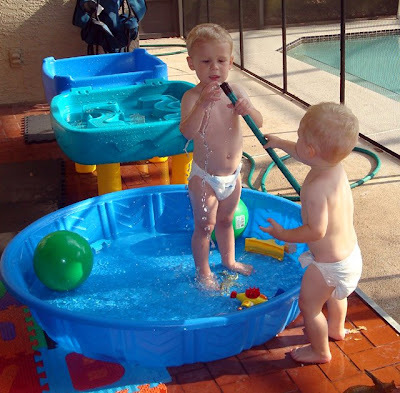 There's no minimal fighting, the mess has been contained to the patio and the boys spend (literally) hours on end splashing in the water. This pool has become a welcome addition to the craigslist/yardsale graveyard that is our patio. p.s. Don't forget to enter my Father's Day Giveaway!!! p.p.s. I do (occasionally) still cook. Oh my, this makes me want a yard/pool/anything of the sort! 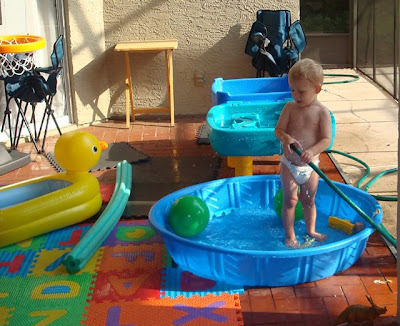 I totally agree, a pool is the BEST thing for kids ever! If it will ever quit raining I'll get ours out. I just don't want to have to sit out there and sit for all those hours making sure my 19 month old doesn't drown. I'll get nothing done! very very fun, and it looks like you have a nice "big" pool back there too! I so wish we had a pool...........damn lack of $$!